Yes another Sewing Double post prompted by the Monthly Stitch challenge. And two posts in two days – will the wonders never cease? 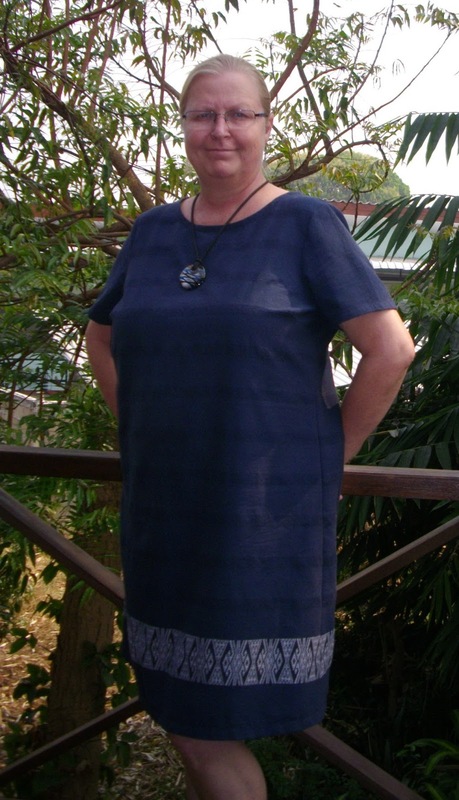 This Kwik Sew pattern, KS2627, is now my TNT shift dress pattern. I have made two dresses and one top from it so far. And yes, it is so far – there will be more. This is my first (and favourite) version. 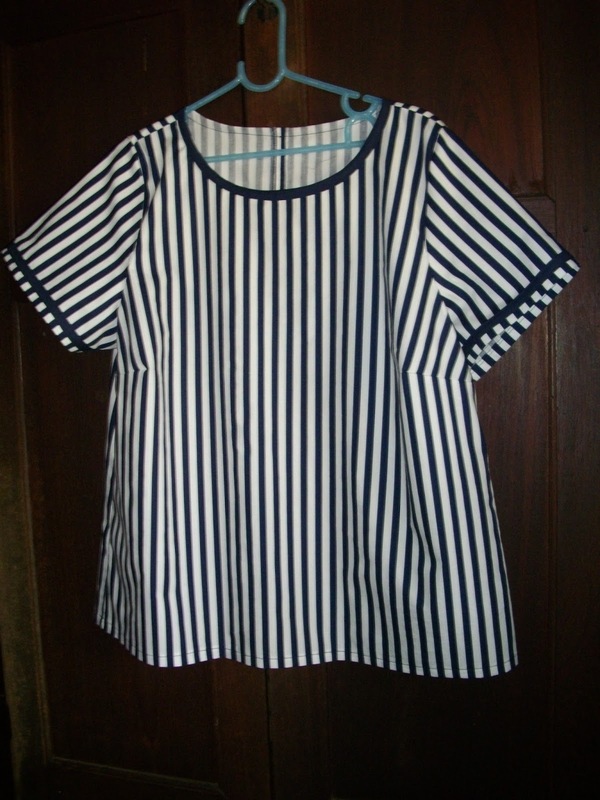 It is navy cotton (made here in Thailand) with a textured self-stripe and a white woven border in a traditional(ish) motif. Now if you’ve visited this blog before you will know (since I’m often moaning about it) just how hot it can be and so I am always looking for cool and comfortable. I am also not averse to a quick and simple sew and this Kwik Sew lives up the name. Oh and it’s free. What’s not to like. I sorted out the admittedly minimal adjustments in my wearable muslin. For my second version I made a couple of design changes. Probably one too many to be honest. I rotated the bust darts to the shoulder and made a square neck. But it seems that both of these can result in a little more room across the upper chest so both together was maybe not such a good idea. Or maybe both together when you don’t actually know what you’re doing isn’t such a great idea. You can read more about that here. Having said that, this dress is in high rotation. It is wonderfully cool, doesn’t crease during wear and only needs a very quick press touch of the iron. Did anyone else call this ‘pressing’ before they began to sew? Seriously, in our house a quick press meant it didn’t mean much ironing. As I’ve said before, I really like simple designs as I hate fidgeting with clothes. Don’t like worrying about where/how they’re sitting. Don’t like fitted just about anything, hate belts/ties/etc. Ok, I’m sure you get the picture. 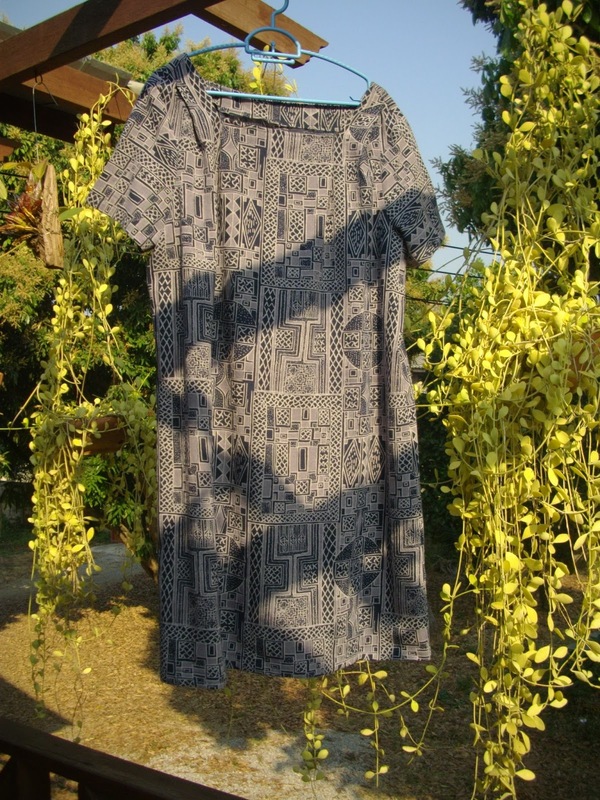 So this pattern is great for both tops and dresses that are cool, comfortable and easy to wear. I have already drafted tulip sleeves for it and plan to start that version very soon. I’d also like to draft kimono sleeves on to it. Can anyone point me in the direction of a good tutorial for this? Thanks Rhonda that's pretty much my definition of success too. Regarding the drafting of kimono sleeves, I have fervently checked your Sleeves on Saturday posts since you are obviously a sleeve superstar but had no luck. Can you point me in the right direction? I can't help on the sleeves front, but I like your dresses. Particularly the first one with the border print at the bottom, really looks good. Thanks very much Louise. I am working on the sleeve drafting – we'll see how that goes….